And Stay Tunes to our Free sms service www.smsgupshup.com/groups/marketbits to recieve free stock and news alerts on your mobile. Update: Even though a bearish thrusting candle occured on 13th May,2008 we are still above tha trend line 4950 as shown in the chart. Even it is witnessed in the 14th May market with nifty closing at 5011. So in near term consolidation pattern may be formed followed by a broke out. Currently Yen also trading fine above 105/dollar. So a strong FII buying can be initiated at this time. 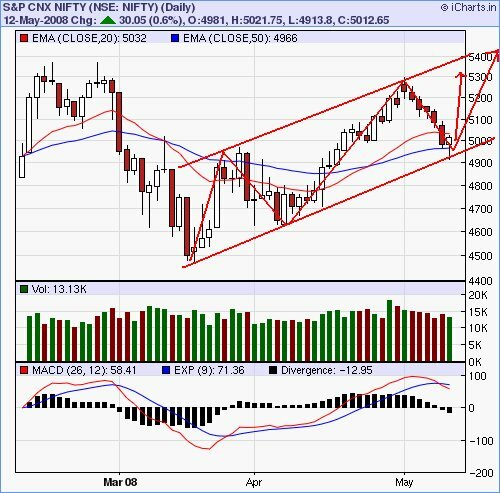 Sure nifty is in the way to head toward the next target of 5358. Dow Jones likely to test the GANN Support 9640 Daily GANN Charts of Dow Jones shows the Next level of GANN Support near 9640. GANN Indicator has been drawn from the 2008 Low to 2010 High.